Make use of our sample letter to help to draft a perfect personalized version. Whether the letter is formal, or not, we advise putting the reason for the leave in the first paragraph of the letter's body. In the paragraphs following, you can use examples to support your main argument. In the final paragraph, you need to summarize the purpose of your letter again and suggest a suitable course of action to follow. Do not indent the paragraphs. But instead, leave an empty line between each paragraph. Close the leave letter without indentation, leaving three or four lines for your signature between the closing and your typed name and title. Please note this leave letter is provided for guidance only. 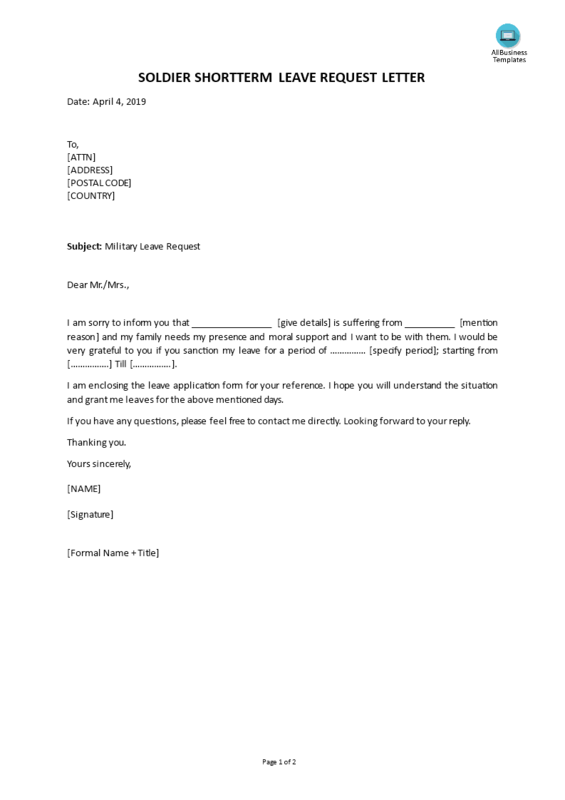 Download this Soldier short term leave request template to write a perfect (and personalized) letter, edited to fit your personal situation. If this letter does not fit your requirements, please also have a look at the topic: Leave Letter Templates.